Lack of security is a common misconception around videoconferencing, but today’s videoconferencing systems are more secure than ever. 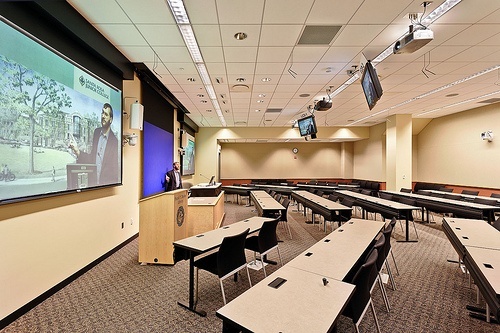 Video conferencing as a means of communicating with your employees and company departments can save you and your workers time, money and energy. However, corporate conferencing systems are not strangers to certain vulnerabilities which enable attackers to perform crimes that range from eavesdropping on confidential meetings to recording password keystrokes, and even reading private documents laid out on conference tables. Therefore, it has always been paramount to place security at the forefront of your internal communication strategy, and to allow it to outweigh the convenience that video conferencing affords. With the emergence of cloud based software that has brought video conferencing within the reach and budget of many more businesses, security is perceived as ever more important. Lack of security is a common misconception around videoconferencing, stemming from the use of insecure video calling software that was never built with the intention of transmitting sensitive business information. In reality, business level cloud video conferencing software is far more robust and secure than many people realize. For your data to be completely secure, it must have the correct protocols in place for the storage of your data as well as its transmission. Enterprise video conferencing software from Cisco, Polycom, LifeSize and Vidyo all employ these protocols as standard procedure. As the data from your video conferences is recorded and archived, secure data storage becomes a key part of protecting your sensitive information. Cloud based software provides a higher level of security than storing your data on company computers and hard drives, primarily due to their sophisticated encryption security and purpose built facilities protected by 24 surveillance. As your data travels to its destination through many public and private networks, it is potentially vulnerable and open to attacks from hackers. It has been a priority of cloud based video conferencing companies to constantly update and test their data encryption technology and network security to prevent data from being intercepted. Their efforts in employing the latest advancements in security ensure your data will be delivered safely and without compromise. Despite misguided perceptions of insecurity, cloud based video conference software has done a lot for the protection of business conversations the world over. Gone are the days when data was left exposed on company networks as a prime target of internet thieves and hackers. Of course, choosing the appropriate software for your business is not an easy task and requires careful consideration. There are an increasing number of options available on the market and thus it is always best to seek advice from an expert in network and data security first. Having a security expert liaise with your IT department can be especially helpful in configuring a system which is compatible with existing infrastructure, is adequately secure, and in line with your business needs.